Photo by Brad Reynolds, S.J. Brecht, Lorca, Goldoni, Gogol, Tolstoy, Coldwell, Bulgakov, Saltykov Shchedrin, Tennessee Williams, and others. She has also worked on 10 animated films. 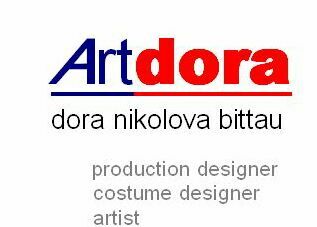 reviews for the Bulgarian magazine “Art”, fashion and films articles, published drawings and caricatures. · FASHION HOUSE “Rila”, Sofia-as costume designer. · BULGARIAN NATIONAL TELEVISION – as head scenographer for the television theatre for the young. Detroit, Fairfax, Williamsburg, New Jersey, New York, and in other cities). for free, feeling uneasy to receive rewards for something that was giving me so much joy and satisfaction”. “Dora’s paintings are the synthesis of the most archaic and vivid static world of the Byzantine iconography tradition. She represent this tradition in the newest manner of today’s expressionism and surrealism”. The artist lives in Rome, Italy. She is married and has a daughter Polina Bittau (New York), and a son Andrea Bittau (S. Francisco CA). Filmografhy, Television, Theatre, Paintings, Exhibition , articles and others….